Chicken and rice has become synonymous with fitness and bodybuilding these days. It seems to the dish that springs to people’s mind when they embark on a fitness programme. “Do I have to eat chicken and rice 4 times a day?” is the usual question that gets asked. The answer is no. Of course you don’t. Setting up your meal plan properly should mean that you have lots of flexibility to enjoy those foods you love and still make progress. I think that the plain chicken and rice crew repeat that same meal out of convenience, laziness, an inability to cook, or a combination of all 3. And I’m guilty of being in that posse for a time, but thankfully I’ve branched out into other dishes. And when I do have chicken and rice, it’s not the plain and boring kind. Frankly I don’t think I could get it down my throat without gagging. Dry chicken, dry rice, and dry vegetables has no appeal for me. 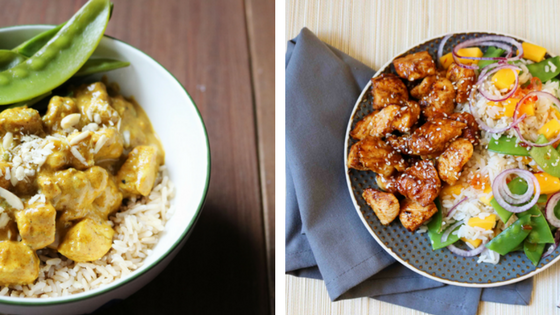 If you’re looking to get out of the chicken and rice rut, then this is the blog for you. Don’t get me wrong, chicken and rice is a great dish. Lean meat and a good source of carbs. It’s perfect for hitting those macros. But you and I both know we can do better than boiling everything. Let’s bring excitement back to this bodybuilding staple. I’m sure you’ll love these two recipes, so get yourself in that kitchen and rustle up something to reignite those taste buds! Heat the oil in a large frying pan and fry the chicken with curry madras 3 min. on medium heat. Add in the coconut milk and water and simmer on low heat for 5 minutes. Meanwhile, cook the beans in salted water until al dente (about 4-5 min). Add the chopped banana to the chicken curry and cook for 1 minute. Season with pepper and salt. Serve the curry sprinkled with flaked almonds alongside a portion of brown rice and mangetout. Cook the rice and set aside in a bowl once ready. Mix the chicken with the spice blend, half the sesame seeds and a little more than half of the chili. Heat a non-stick pan without oil or butter and fry the chicken for 10 min, on medium heat until golden brown, stirring regularly. In the meantime, cut the mange tout into half and boil for about 4 min. Drain and leave aside. Whisk the oil and the rest of the chili sauce to make dressing. Peel the mango and cube the flesh. Cut the onion into thin rings. Mix the rice with the rest of the sesame seeds, mange tout, mango, onion and dressing. To serve divide the rice between two bowl/plates and place the chicken on top. There you have it. Chicken and rice need never be that boring dish you dread when you open up those Tupperware boxes. Work these two dishes into your macros and i guarantee you’ll keep coming back time after time. They’re also so tasty that the whole family can enjoy them with you. No more being the social outcast of the family. I hope you enjoy them and I’d love to know what you think. I’d also love to see your own creations after you’ve given the recipes a try. Tag me in your photos on Facebook and Instagram. The best photo will get a 10% discount of a personalised training programme and one day meal plan. Get cooking and GET CREATIVE with those pics! Make sure you subscribe to the blog by putting your name and email address in the box below. That way you can be kept right up to date when new recipes and other blogs get posted. You’ll also be on the mailing list for exclusive offers on my coaching programmes. I’m always happy to answer any questions you have about all things fitness, so don’t be shy. Enjoy your meal prep and enjoy the recipes.